This McCartney ballad on Beatles for Sale (and Beatles '65 in the U.S.) was recorded October 18, 1964 at Abbey Road Studios. Lennon thought it a typical McCartney number but still thought that it was a "nice one." McCartney sings lead vocal and Lennon harmony. 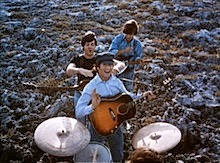 McCartney and Lennon play acoustic guitars, Harriosn lead, and Starr bongos.